In Chapter 10 – Risk and Money Management we will discuss how to maximize your profits while minimizing your risk, using one of the most important tools of forex trading – proper money and risk management. This will help you mitigate your risk and still allow you to make a nice profit. There is no doubt that when building a trading plan, your risk management strategy is critical. Proper risk management allows us to remain in the game for longer, even if we experience specific losses, mistakes or even bad luck. If you treat the Forex market as a Casino, you will lose! It is important to trade each position with only small parts of your capital. Do not put all of your capital, or most of it, in a single position. The goal is to spread and reduce risks. If you built a plan which is expected to produce 70% profits, you have a fantastic plan. However, at the same time, you will need to keep your eyes open for losing positions, and always keep reserves in case of several unexpected, consecutive losing positions. The best traders are not necessarily the ones with the fewest losing trades, but the ones who only lose small amounts with losing trades and earn high amounts with winning trades. Obviously, other issues impact the level of risk, such as the pair; day of the week (for example, Fridays are more dangerous trading days due to strong volatility before closing the week’s trading; another example – by trading JPY during the busy hours of the Asian session); time of year (before vacations and holidays increases the risk); proximity to major news releases and economic events. However, there is no doubt as to the importance of three trading elements. By paying attention to them you will be able to properly maintain your risk management. Every respectable platform allows you to use these options and to update them live. Another good option is called “Trailing Stops”: setting trailing stops allows you to retain your earnings while the trend goes in the right direction. 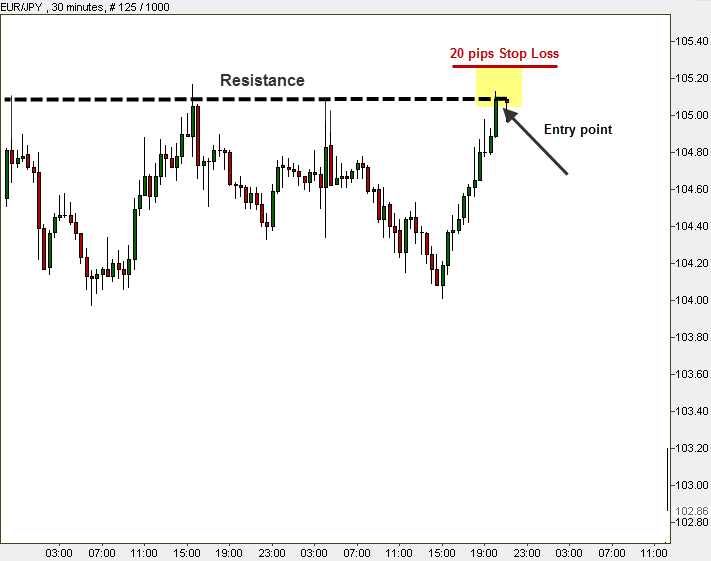 For instance, say you set a Stop Loss 100 pips higher than the current price. If the price reaches this point and continues to go up, nothing will happen. But, if the price starts dropping, reaching this point again on its way down, the position will automatically close, and you will exit the trade with 100 pips of revenues. That is how you can avoid future decreases that will eliminate your profits to date. The volatility of a given pair determines how risky it is to trade. The stronger the market volatility, the riskier it is to trade with this pair. On the one hand, strong volatility creates great earning options due to the many powerful trends. On the other hand, it could cause quick, painful losses. Volatility is derived from fundamental events that influence the market. The less stable and solid the economy, the more volatile the charts will be. If we look at the major currencies: The most secure and stable majors are USD, CHF and JPY. These three majors are used as reserve currencies. The central banks of most developed economies hold these currencies. This has an inevitable, major impact on both the global economy and exchange rates. USD, JPY, and CHF constitute the majority of the global currency reserves. EUR and GBP are also powerful, but during recent years they have been considered less stable – their volatility is higher. Particularly, the GBP after the Brexit referendum. The Euro lost about five cents after the referendum, while the GBP lost more than 20 cents and the trading range in GBP pairs remains several hundred pips wide. Moving Average: Moving Averages help trader follow the ups and downs of a pair during any period, by examining the pair’s history. Bollinger Bands: When the channel becomes wider, volatility is high. This tool evaluates the current status of the pair. ATR: This tool collects averages throughout chosen periods. The higher the ATR, the stronger the volatility and vice versa. ATR represents historical evaluation. We have emphasized this numerous times throughout the course. There isn’t one person in the world, not even Mr. Warren Buffett himself, who can predict all price movements. There is no trader, brokerage or bank that can foresee every trend at any given time. Sometimes, Forex is unexpected, and may cause losses if we are not careful. No one could predict the social revolutions that occurred in the Arab markets at the beginning of 2011, or the major earthquake in Japan, yet fundamental events like these have left their marks on the global Forex market! Stop Loss is a very important technique, designed for reducing our losses in times when the market behaves differently than our trades. Stop Loss plays a critical role in every successful trading plan. Think about it – sooner or later you will make mistakes that will lead to losses. The idea is to reduce losses as much as you can, while expanding your earnings. A Stop Loss order allows us to survive bad, losing days. Stop Loss exists in every online trading platform. It is executed when we give the order. It appears right next to the price quotation and call for action (Buy/Sell). 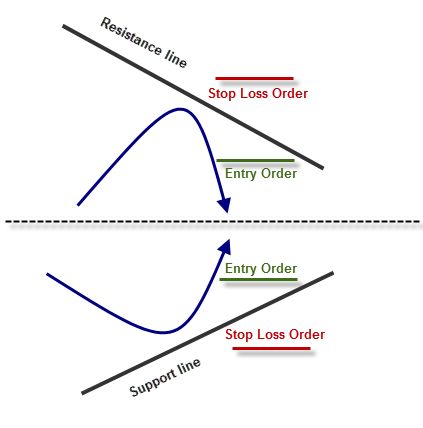 How should you set a stop loss order? Place a stop loss sell order on long positions just below the support level, and a stop loss buy order on short positions just above the resistance. For example: if you want to go long on EUR at USD 1.1024, a recommended stop order should be a little lower than the current price, say around USD 1.0985. Equity Stop: Determine how much we are willing to risk out of our total amount, in percentage terms. Assume you have $1,000 in your account when deciding to enter a trade. After thinking for a few seconds, you decide that you are willing to lose 3% of your total USD 1,000. This means that you can afford to lose up to USD 30. You will set the Stop Loss below your buying price, in a way that will permit a maximum, potential loss of USD 30. That way you will be left with USD 970 in the event of a loss. At this point, the broker will automatically sell your pair and remove you from the trade. More aggressive traders set stop-loss orders around 5% distant from their purchase price. Solid traders are usually willing to risk around 1%-2% of their capital. The main problem with equity stop is that while it takes the trader’s financial condition into consideration, it doesn’t take current market conditions into consideration at all. A trader is examining himself instead of examining trends and signals produced by the indicators he uses. In our opinion, it is the least skillful method! We believe that traders have to set a Stop Loss according to market conditions and not on how much they are willing to risk. Example: Let’s assume that you opened a USD 500 account, and you want to trade a USD 10,000 lot (a standard lot) with your money. You wish to put 4% of your capital at risk (USD 20). Each pip is worth USD 1 (we have already taught you that in standard lots, each pip is worth 1 currency unit). According to the equity method, you would set your stop loss 20 pips away from the resistance level (you plan to enter the trend when the price reaches the resistance level). You choose to trade the pair EUR/JPY. It is very important to know that when trading the majors, a 20 pips move might last just a few seconds. This means that even if you are right in your overall predictions on a future trend’s direction, you might not get to enjoy it because just before the price went up it slipped back and touched your Stop Loss. That´s why you must place your stop at reasonable levels. If you can’t afford it because your account is not big enough, then you must use some money management techniques and probably reduce the leverage. Chart Stop: Setting a Stop Loss not based on price, but according to a graphical point on the chart, around support and resistance levels for instance. Chart Stop is an effective and logical method. It gives us a safety net for an expected trend which has not actually taken place yet. Chart Stop can either be determined by you in advance (Fibonacci levels are recommended areas for setting a Stop Loss) or under a specific condition (you can decide that if the price reaches a crossover point or a breakout, you close the position). 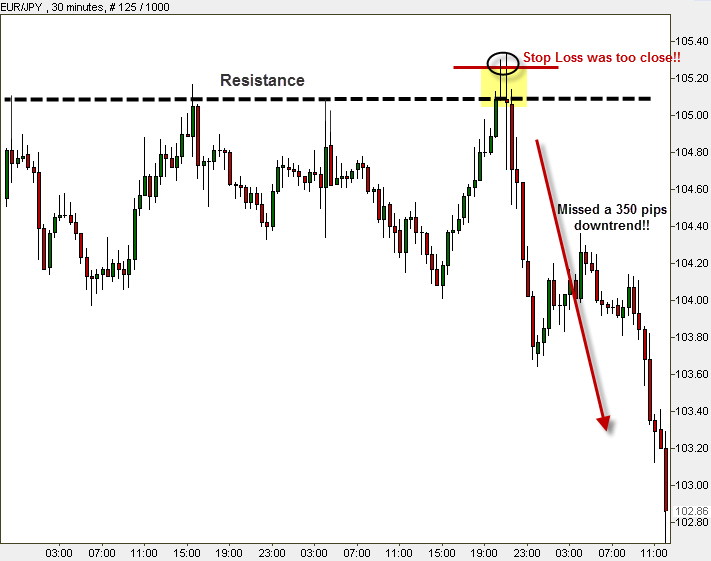 We recommend working with Chart Stop Losses. For example: if you plan to enter a BUY order when the price reaches the 38.2% level, you would set your Stop Loss between levels 38.2% and 50%. Another option would be to set your Stop Loss just below the 50% level. By doing so you would give your position a bigger chance, but this is considered to be a slightly more dangerous decision that might cause more losses if you are wrong! Volatility Stop: This technique was created to prevent us from exiting trades due to temporary volatile trends that are caused by current pressure among traders. It is recommended for long-term trading. This technique is based on the claim that prices move according to a clear and routine pattern, as long as there is no major fundamental news. It works on expectations that a certain pair is supposed to move during a time period within a given pips range. For example: if you know that EUR/GBP has moved an average of 100 pips a day throughout the past month, you would not set your Stop Loss 20 pips from the opening price of the current trend. That would be inefficient. You would probably lose your position not because of an unexpected trend, but because of the standard volatility of this market. Tip: Bollinger Bands are an excellent tool for this Stop Loss method, setting a Stop Loss outside of the bands. Time Stop: Setting a point according to a time frame. This is effective when the session has already been stuck for a long period (price is very stable). Don’t set your Stop Loss too close to the current price. You don’t want to “strangle” the currency. You want it to be able to move. Don’t set your Stop Loss exactly on the support and resistance levels. That’s a mistake! In order to improve your chances you need to give it a little space, as we have already shown you countless cases where the price broke these levels by just a few pips, or for a short time, but then moved right back. Remember- levels represent areas, not specific points! Don’t set your Stop Loss too far from the current price. It may cost you a lot of money just because you didn’t pay attention or looked for an unnecessary adventure. Don’t change your decisions after making them! Stick to your plan! The only case in which it is advised to reset your Stop Loss is in case you are winning! If your position makes profits, you had better move your Stop Loss towards your profitable zone. You have already learned about the significance of leverage and the possibilities it offers. With leverage, you can multiply your profits and earn much more than your real money could have earned. But in this section, we will talk about the consequences of Over Leverage. You will understand why irresponsible leverage might be devastating for your capital. The number one reason for traders’ commercial demise is high leverage! Important: Relatively low leverage can create tremendous profits for us! Leverage – Controlling a large amount of money while using a small part of your own money, and “borrowing” the rest from your broker. Remember: We recommend you not work with a leverage of more than x25 (1:25) under any conditions! For example, you should not open a standard account (USD 100,000) with USD 2,000, or a mini account (USD 10,000) with USD 150! 1:1 to 1:5 are good leverage ratios for large hedge funds, but for retail traders, the best ratio varies between 1:5 and 1:10. Even very experienced traders who considered themselves big risk lovers do not use a leverage of more than x25, so why should you? Let’s study the market first, earn some real money and get some experience, working with low leverage, then, move to slightly higher leverage. Some commodities can be very volatile. Gold, Platinum or Oil move hundreds of pips in a minute. If you want to trade them, your leverage must be as close to 1 as possible. You should protect your account and not turn trading into a gamble. Right now, your position is very risky! You are totally dependent on the EUR/USD. If this pair goes bullish you win a great deal of money, but if it goes bearish you are in trouble! Your equity will decrease as long as EUR/USD loses value. The minute the equity falls under your used margin (in our case USD 8,000) you will receive a “margin call” on all of your lots. 25 pips decrease will activate a margin call. 10,000 – 8,000 = USD 2,000 loss because of 25 pips!!! It can happen in seconds!! Why 25 pips? In a mini account, each pip is worth USD 1! 25 pips scattered over 80 lots are 80 x 25 = USD 2,000! At that exact moment, you lost USD 2,000 and are left with USD 8,000. Your broker will take the spread between the initial account and your used margin. We still have not mentioned the spread that the brokers take! If in our example the spread on the pair EUR/USD is fixed at 3 pips, the pair needs to decrease only 22 pips for you to lose these USD 2,000! Important: Now you understand even more why it is so important to set a Stop Loss for every position you open!! Remember: In a mini account, each pip is worth USD 1 and in a standard account, each pip is worth USD 10. High leverages, such as x50 or x100 for instance, could produce astronomical gains, of tens and hundreds of thousands of dollars, in a very short time! But you should only consider this if you are prepared to take serious risks. A trader can use these high ratios only in extreme conditions when the volatility is low and the price direction is almost 100% confirmed, probably around the time the US session closes. You can scalp a few pips with high leverage because the volatility is minimal and the price trades in a range, which makes the direction easily detectable in the short term. Remember: The ideal combination is low leverage and large capital on our accounts. Just as a good business plan is required when starting a new business, in order to trade successfully we want to plan and document our trades. Once you have decided on a trading plan, be disciplined. Don’t get tempted to stray from the original plan. The plan that a given trader uses, tells us a great deal about his character, expectations, risk management, and trading platform. A plan’s core is how and when to exit trades. Emotional action can cause damage. Determining your goals is important. For example how many pips or how much money do you plan to earn? Which point on the chart (value) do you expect the pair to reach? For example: it would not be clever to set a short-term trade if you don’t’ have enough time during the day to sit in front of your screen. Your plan is your compass, your satellite navigation system. 90% of online traders do not build a plan, and that, among other reasons, is why they do not succeed! Trading Forex is a marathon, not a sprint! Remember: After putting your energy into the MARKET LEADERS FOREX COURSE you are ready to implement, but do not be smug! Let’s try to get into it gradually. Whether you wish to open a USD 10,000 or USD 50,000 account, we recommend you hold your horses. It is not advisable to invest all your capital in a single account or to take unnecessary risks. What is hot in the Forex market and other markets, such as commodities and indices markets? Be tuned in to the Financial markets forums and communities. Read what others write, follow current hot trends in the market and be aware of less fashionable opinions. Make FXLeaders.com your Forex opportunities window. Follow the economic news, as well as general global news. You have already become aware that these have a tremendous impact on currencies. Try to follow daily global commodity prices (gold or oil for example). They often have a large influence on some currencies, such as the USD for example and vice versa. Follow FX Leaders forex signals, which at the very least give you an experienced opinion of what traders and analysts think of a forex pair at a certain time. How did the market respond? Deciding on the right indicators for identifying trends. For example, choosing 2 SMA lines (Simple Moving Averages): a 5 SMA and a 10 SMA, and then, waiting for them to intersect! Combining this indicator with Fibonacci or Bollinger Bands can be even better. Using indicators that confirm the trend – RSI, Stochastic or MACD. Deciding on how much money we are willing to risk losing. Setting Stop Losses is essential! Planning our entries and exits. You don’t need to use your phones, go to your bank or employ an investment consultant with a diploma in order to trade the Forex market. All you need to do is choose the right forex broker and the best trading platform for you and simply open an account. There are two types of brokers, brokers with a Dealing Desk and brokers with No Dealing Desk. NDD brokers guarantee an unbiased trade, 100% automatic, without the intervention of dealers. Therefore, there cannot be a conflict of interest (it might happen with DD brokers, who serve as your banks and at the same time trade against you). Security: We advise you to choose a broker who is subject to regulation by one of the major regulators – such as the American, German, Australian, British or French regulators. A brokerage that works without regulatory supervision at all might be suspicious. Trading Platform: The platform has to be very user-friendly and clear. It also has to be simple to operate, and include all technical indicators and tools that you wish to use. Extras such as news sections or commentaries add to the quality of the broker. Transaction Costs: You have to check and compare spreads, fees or other commissions if there are any. Call to action: Accurate price quotes and fast reactions to your orders. An optional practice account: Once again, we recommend practicing a little on your chosen platform before opening a real account. Choosing an account type: Determines the capital that you wish to deposit, which derives from the amounts of money that you wish to trade with. Registration: Includes filling up your personal details and signing up. Account Activation: At the end of the process you get an email from your broker, with username, password, and further instructions. Tip: Most of our most recommended brokers, such as eToro and AvaTrade, offer a personal account manager when depositing $500 or more in your account. A personal account manager is a fantastic and important service, which you definitely want on your side. It might be the difference between struggling and succeeding, especially if you are a beginner. An account manager will help you with every technical question, tip, trading advice and more. Remember: Ask for a personal account manager when opening an account, even if it means calling the brokerage’s help desk. We strongly recommend opening your account with the big, reliable and popular brokers from the FX Leaders recommended forex brokers site. They have already earned a high reputation and large, loyal clientele. Start to wander a little between different pairs and timeframes on the platform. Observe and spot different levels of volatility, low to high. Use indicators like Bollinger Bands, ATR and Moving Averages to help you with volatility tracking. When buying a single Standard Dollars Lot, with 10% margin, what is our actual deposit? We have deposited USD 500 in our account and we wish to trade with x10 leverage. How much capital will we be able to trade with? Say we buy EUR with this total amount, and EUR rises five cents. How much money would we make? Stop Loss: What is the difference between an Equity Stop and a Chart Stop? Which method is better? Would it be right to set a Stop Loss on the support/ resistance level? Why? Is it advised to leverage? If yes, to what level? What are the main criteria for a good broker? Chart Stop, because it relates not only to economic conditions but to market trends and movements as well. It could be a good idea, but not under all circumstances. It depends on how high are the risks you are willing to take. Heavy traders who trade with large capital on long-term trades do not necessarily leverage. Leverage certainly can bring great profits, but it is not advised to exceed the x10 level. Security; Reliable customer service; Trading platform; Transaction cost; Accurate price quotes and speedy reactions to your orders, social trading, and a friendly platform for automatic trading. In Chapter 11 – Forex in Relation to Stocks and Commodities and trading with MetaTrader you will learn about the relationship between commodities and indices to the forex market. In addition, you will learn how to use MetaTrader, the most common trading platform today.